Last week, I was walking to my car when I spotted some money on the ground. It was only a quarter, a dime and a penny so I figured I’d pass it up. Yet, I found myself strangely compelled to pick up the money. For some odd reason, it brought to mind my childhood. My sister and I would constantly pick up whatever money we found lying around. Usually, this would be a penny here and a dime there. Occasionally, we’d luck out and spot a dollar bill. One time we spotted a twenty. I thought that a guy standing near it had dropped it so I decided to wait to see if he’d pick it up. My sister didn’t wait and grabbed the twenty. My father would constantly tell us that it was a waste of time picking up that money, but we insisted that all those pennies, nickles, dimes and quarters added up. We disagreed, of course. In some respects, I’ve proven him wrong thanks to my recent 12 pound coin deposit. As I got older, however, I passed money on the ground more and more. I found it just wasn’t worth my while to walk across a room just to pick up a nickle. For some reason, however, I felt an urge to pick up this 36 cents. After picking it up, I began to think. I still wouldn’t pick up a lone penny on the sidewalk, but would definitely go out of my way if I spotted a twenty on the ground. I wondered what was the threshold a given amount of “ground money” had to reach before it turned into a worthwhile amount for an adult to pick up. 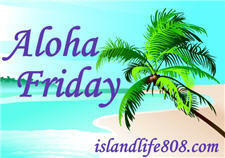 So my Aloha Friday question to you is: What is the smallest amount of money that you would pick up off the ground? LOL, I’ve definitely stopped to pick up a penny. It *does* matter though how dirty it is or where it fell LOL! I usually will pick a penny up if I see it. Hmmmmmm great question. Definitely a quarter….maybe a dime. 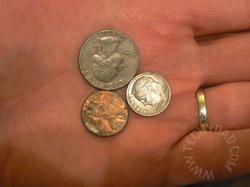 I used to love finding the smallest of coins as a kid. My sister and I would have contests on our bikes to see who could find money……..it was rare. .-= Debra @ A Frugal Friend´s last blog ..Aloha Friday =-. Haha, I pick up a penny. I still pickup pennies. Found one 2 nights ago, after spending $130 at Hair Salon. Salon Owner laughed @ me as I picked it up. I only skip coins on restroom floors, ha ha! Found a $20 bill one time, two years ago, on a day before major surgery. Picked it up and figured it was a good omen, way better than a penny! When my daughter was a little girl, we would put a shiny penny behind our car on parking lots to see if it would be gone when we came out of the store. 9 times out of 10 the penny was gone! Probably a nickel. I hate pennies. I am the guy who throws pennies on the ground. I know pennies are money but for some reason I really hate them. I need to stop it. I’m gonna say that I would pick up any amount I saw, but I have been known to pass up a penny here or there. It just depends on how full my hands are at the time. I’m also picking up pennies. They add up. .-= MadeInCanarias´s last blog ..Aloha Friday #23 =-. A piggy bank don’t get full by a big one. It’s little by little, so I’d pick up whatever I see and drop it in the piggy. Soon it will pay off. I have picked up lots of pennies. I always think my grandpa sends them my way.